HEALTHCARE.GOV .gov! .G O V! DOT GOV!!! (Which is GOVERNMENT-RUN hence, the ".gov" web domain.) 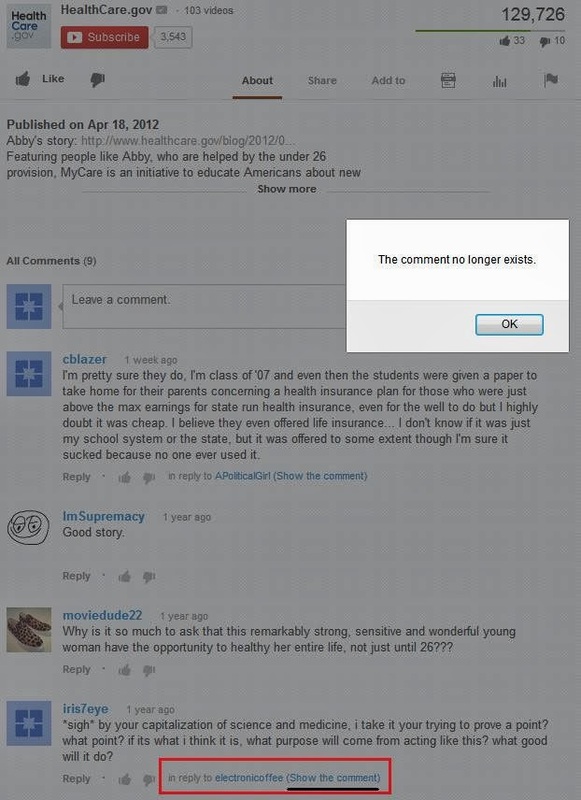 They're NOT allowing all comments under their (YOUR) YouTube videos! 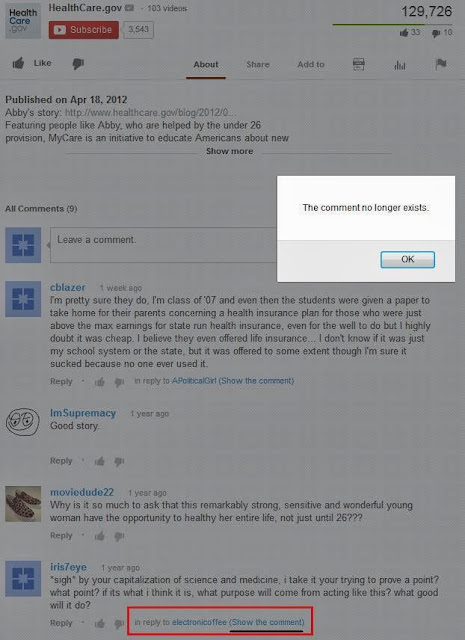 A government-run entity is NOT allowing people to post comments without approval on YouTube. I'm not embedding one of their videos here because in order to see this in motion you have to actually go to YouTube to see what I'm talking about. "Deborah's Covered. You Can Be Covered Too!" At the time of this blog post that video has 9 "likes" and 123 "dislikes" on YouTube. 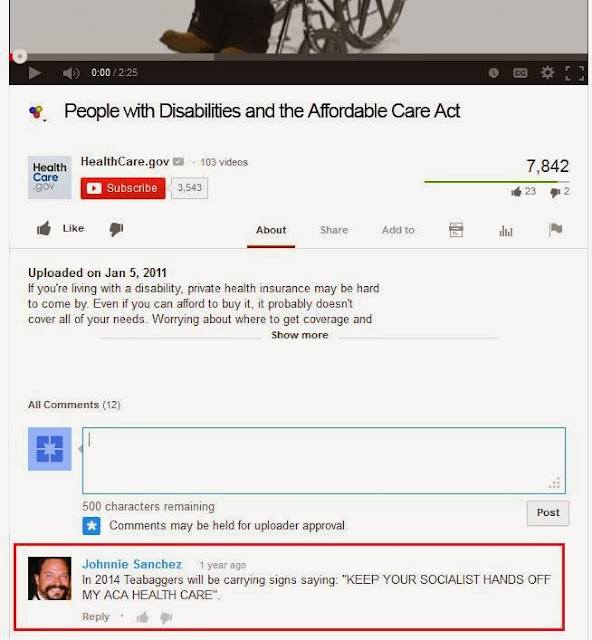 The number of nasty comments Healthcare.gov's videos are probably receiving daily must be a staggering number. Oddly, that video only has ONE COMMENT after being viewed more than 17K times. You're not only paying for other people's healthcare, now you're paying for the production of crappy videos and you CAN'T EVEN COMMENT ON THEM!!! 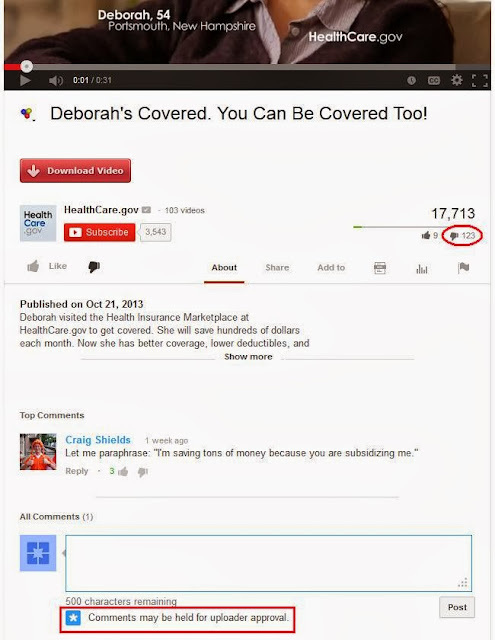 Healthcare.gov censoring comments on YouTube. I looked at a few of the other videos posted on the Healthcare.gov YouTube channel to see if they're censoring the comments on other videos as well. I looked at about 10 of their other videos and ALL of them that I checked were being censored. Apparently "teabaggers" is a term that is APPROVED of by Healthcare.gov, as the picture below shows. The "teabagger" comment in the screen shot below was approved "one year ago". "People with Disabilities and the Affordable Care Act"
The following picture shows you that someone from Healthcare.gov has REMOVED a comment that was either posted BEFORE comments were being approved OR removed by one person from Healthcare.gov AFTER another person had approved it. At the bottom of this screen shot, I clicked on "Show the comment" underneath the comment from "iris7eye" which was in reply to the comment by "electronicoffee". The comment made by "electronicoffee" no longer exists (because someone from Healthcare.gov removed it). "MyCare: Abby S. in Minneapolis, MN"